NEW YORK, Dec. 12, 2017 /PRNewswire/ -- Armarium is pioneering the next wave of shopping for luxury fashion. 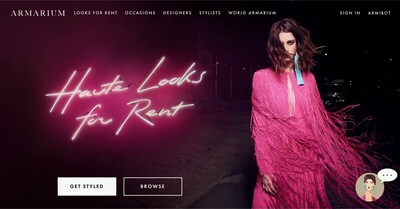 The elite rental and styling platform renowned for offering the best edit of high fashion to rent as well as the best industry stylists to hire, will launch a multi-channel, fully responsive and interactive online experience that is poised to transform the shopping and retail space. On December 12, 2017, Armarium will unveil an online evolution that offers an innovative lineup of premiere technology, styling, and editorial features alongside a seamless in-store retail integration, the first of its kind. Armarium is known for its impressive roster and exclusive access to luxury brand rentals from elite designers such as Emilio Pucci, Christopher Kane, and Naeem Kahn alongside its collective of top stylists from around the globe known as the "Style Brigade". Armarium will now further amplify the online luxury shopping experience with an elevated, service-centered experience that includes a renewed emphasis on styling through an advanced virtual stylist named the "ARMIBOT", which procures looks and personalized lookbooks based upon personal preferences. The new robust online ARMI experience will be effortlessly accessible at client's fingertips, offering direct access to stylists both from the Style Brigade as well as the bot, in addition to enriched editorial content and "Complete the Look" component available to select fashion retail partners. In tandem with relationship commerce platform House Account, Armarium is pleased to be launching with Kirna Zabete, Pilot and Powell, Capitol, Copious Row and 20Twelve. Originally launched in 2015 by fashion industry veterans Trisha Gregory (CEO) and Alexandra Lind Rose (Creative Director at Large), the innovative new platform from Armarium is responsive to a shifting fashion retail landscape, positioning the intricacies of luxury to a new generation of millennial spending within a sharing/borrowing economy. With a quest to deliver an elevated level of service through an online interface that both protects brand integrity and ignites new clientele, the new Armarium site is an originative platform that redefines the luxury fashion shopping experience. "Armarium came from my own understanding and industry experience that really showcased the discrepancy between old world values and new world needs," remarks Armarium CEO Trisha Gregory. "Armarium sees its service as an integration into the luxury retail experience by enhancing and bringing relevance via share economy principles that make sense for this industry. The customer and client is changing. And we see that Armarium's focus to offer both technological and new retail tools will allow the client to appreciate the luxury designers in a much more relevant capacity." Armarium is backed by fashion powerhouses such as Net-a-Porter's Carmen Busquets, Brown's Holli Rogers and Tommy Hilfiger, who serve as founding advisors and investors strategic to the growth of the platform with investment, retailers and partners. With the recent support of Adrian Cheng and Clive Ng's C Ventures, a global ecosystem to accelerate growth for a next generation of companies focused on fashion tech and media, Armarium is uniquely positioned to further focus on the millennial audience with a personalized service throughout the globe. The new Armarium website will launch a premiere technology called the "ARMIBOT", which provides seamless digital styling for customers in real time. The ARMIBOT was developed closely with the styling expertise of Armarium's Style Brigade, a selected network of the top celebrity and editorial stylists around the globe whose unparalleled fashion intelligence is available for hire through the site. The ARMIBOT captures client preferences through an advanced technology and cheeky style bot, learning about client's body type, sizing, styles and influences. In turn, a precise client profile is created that enables the Armarium team to create a personalized and beautifully designed lookbook complete with styling notes to inspire and match clients to the perfect look for their upcoming event. Personal client lookbooks are delivered within 24 hours via a direct link within the website interface, via text, or through the mobile app. If a client requests a more high-profile styling experience, a member of the Style Brigade can create a custom lookbook upon request for a small fee, to be delivered within 72 hours. A ground-breaking development that merges the world of e-tail with in-store retail, the new Armarium site will enhance the shopping experience at partnering e-commerce and upscale fashion boutique websites across the nation. Through the ARMIBOT, Armarium stylists will service clients by enabling them to streamline an edit of full price suggestions of "Complete the Look" pieces from Armarium's favorite e-commerce platforms and luxury boutique websites. This integration on the Armarium site was created as a complement to retail experience and as a response to brands that are trying to further navigate e-tail and online retailers who are looking to further service the client. A curated group of luxury boutiques around the nation will utilize the ARMIBOT lookbook technology on-site in their retail locations. To ensure that a client does not leave a store empty-handed, through the Armarium partnership the sales team will have access to the Armarium lookbook platform where they will have access to the full rental inventory and can suggest any statement dress from the site to rent or "Complete the Look" with shoes and accessories. Armarium complements the inventory that a retailer has available in person, and instead of potentially losing a sale, Armarium can offer more inventory via their online site for purchase. The "Complete the Look" initiative operates as an organic service offering that enhances the client experience, establishing new customers and further servicing regulars through beautifully styled inventory selections not found in the boutique. "The launch of the 'Complete the Look' feature on Armarium is a collaborative experience that is the perfect complement to retail," remarks Trisha Gregory, CEO. "Our mission is to deliver a revived sense of empowerment through the shopping and selection process to the customer." An integral component to the new Armarium interface, the site will be layered with original and exclusive lifestyle content. The fresh editorials and photoshoots will be created by members of the Style Brigade, further showcasing the aesthetic and eye for styling Armarium rental looks of this select group of the world's foremost stylists. The first wave of high-concept editorial photoshoots will be styled by Style Brigade members: Nausheen Shah, J. Errico, and Meredith Melling and Valerie Boster of La Marque and La Ligne, shot by Ungano + Agriodimas. Each editorial will also feature pieces that are available for purchase through Armarium's "Complete the Look" partners, as an additional component. In tandem with the launch of the new online platform, Armarium will continue their signature pop-up experiences and special events throughout the US. On December 13-14, Armarium will be hosting a Bought/Borrowed trunk show at Pilot and Powell in New Orleans in addition to a pop up experience this January in Los Angeles to kick off award season. These events will introduce the ARMIBOT to clients on-site and enable them to be the first in the nation to receive custom Style Brigade lookbooks. As part of the launch rollout, Armarium is set to name a Fashion Director who will serve as a key part of the management team. The Fashion Director, anointed from the Style Brigade, will be responsible for the luxury fashion brand matrix, the encompassing aesthetic, and the brand content of the brand both on- and offline. ARMARIUM is the online platform transforming the retail and service space with its premiere online luxury rental destination. The network curates and creates a fully immersive and one of a kind customer experience with the most coveted designer fashion and accessory selections from designers such as Emilio Pucci, Christopher Kane, and Naeem Kahn to rent, access to personalized recommendations courtesy of top stylists around the globe (the Style Brigade), an ARMIBOT service for digital styling, and in-person touch points via their pop-up experiences, events and newly launched in boutique retail integration. Founded in 2015 by fashion industry vet's Trisha Gregory and Alexandra Lind Rose, the platform gives access to clients as the ultimate destination transforming the fashion space. For more information on Armarium, please visit www.armarium.com. Connect with Armarium at www.facebook.com/worldarmarium and Instagram on www.instagram.com/worldarmarium.